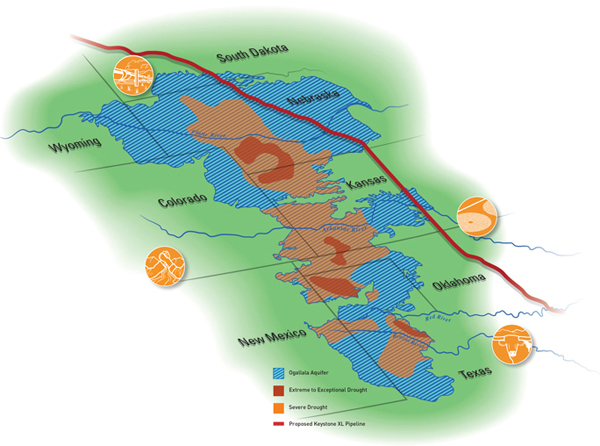 Can Ogallala Aquifer Survive Drought and Pollution? Stretching across eight states, the Ogallala aquifer is the lifeblood of agriculture on the Great Plains. But can it survive a future of drought, pollution, and pipelines? The high plains aquifer, also known as the Ogallala aquifer, is one of the largest in the nation and the primary source of water for a vast stretch of our agricultural heartland. But what exactly is an aquifer, and how does it work? Many imagine a giant underground lake—in fact, the Ogallala is sometimes referred to as the sixth Great Lake. But it is actually more like a giant sponge, partially saturated with ancient glacial meltwater and consisting of layers of permeable rock, clay, sand, and silt deposited during geological shifts in the Rocky Mountain region millions of years ago. Underlying almost 175,000 square miles in eight states, the aquifer sustains nearly one-fifth of all wheat, corn, cotton, and cattle production in the United States. But several years of drought and decades of intensive crop irrigation have left it seriously depleted in some places, particularly in Texas and Kansas. (Recent rains have made little difference.) Drought conditions in areas just outside the aquifer, such as eastern Colorado, are also critical. Worse, depletion of the Ogallala is accelerating. With more severe droughts projected as a result of climate change, the aquifer may face even greater challenges in the future. And the quantity of water is not the only problem. Its quality is also threatened by the overuse of agricultural pesticides and now the risk of oil spills from the proposed Keystone XL pipeline. OIL AND WATER TransCanada’s pro-posed Keystone XL pipeline would run from the Alberta tar sands to refineries in Texas. Facing concern over the risks of an oil spill, the company has revised the route of the pipeline to skirt the Nebraska Sand Hills, a major source of natural recharge for the Ogallala. But the new route would still cross the aquifer, including areas where water is less than 10 feet from the surface. FIGHT CLUB Water rights have long been a source of conflict between states. But shrinking Ogallala reserves have worsened tensions in watersheds like the Red and Republican rivers, where downstream users are disproportionately affected. Claims by Kansas that Nebraska and Colorado have violated the 1943 Republican River Compact have come before the Supreme Court several times since 1998. THIRSTY CROPS About 95 percent of the water pumped from the Ogallala is used for irrigation. 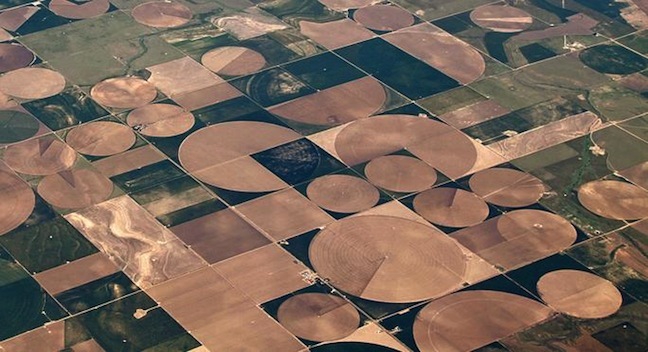 Most of that water is fed into center-pivot irrigation systems, which made large-scale agriculture possible in the Plains. A more efficient technique called subsurface drip irrigation delivers water directly to the roots, greatly reducing waste. MOVE’EM OUT Drought has taken a heavy toll on cattle ranching, especially in Texas. Though recent rains have helped, grazing fields were too dry to support grasses over the summer, and the cost of commercial feed soared. Many farmers have been forced to sell off part of their herds. 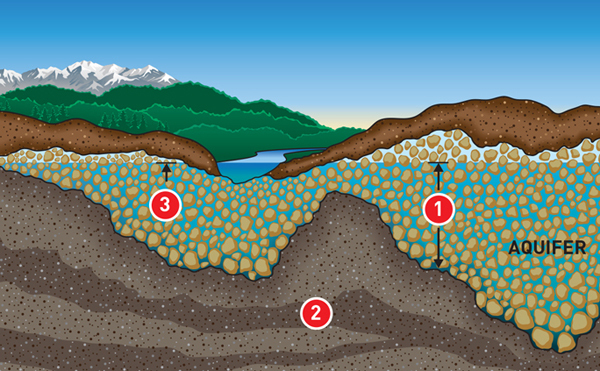 One key gauge of water capacity in an aquifer is (1) saturated thickness—the distance between the bottom of the aquifer, where it meets (2) bedrock, and (3) the water table, the uppermost surface of underground water. Saturated thickness varies widely throughout the Ogallala from year to year, from zero in parts of Colorado and New Mexico to about 1,000 feet in west-central Nebraska. The variation depends on the depth of geologic deposits as well as on local climate, rainfall, and irrigation. Water in the Ogallala generally flows west to east, but does not travel easily from one section to another, so water quality and supply are highly variable. 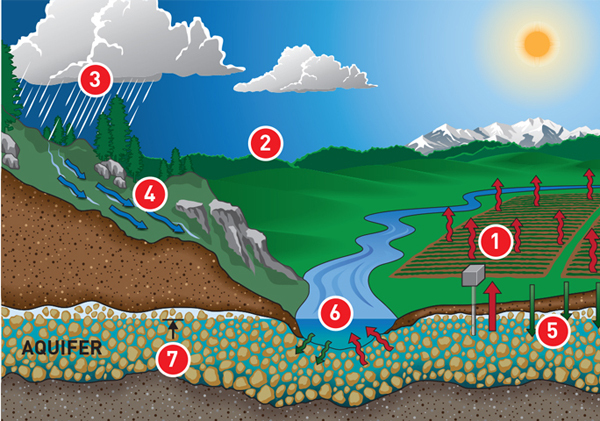 An aquifer is depleted primarily by (1) pumping for irrigation and (2)evapotranspiration from water, soil, and vegetation. The main sources of recharge are (3) precipitation, (4) runoff from heavy rains, and (5) excess irrigation water (as well as industrial wastewater and treated sewage). Rivers and streams (6) both discharge into the aquifer and carry water away from it, depending on local rainfall and the difference in elevation between riverbed and (7) water table, among other things. Soil composition is also important. Gravel and sand, being more porous, recharge more quickly. The soils atop the Ogallala are often clay and silt, so it recharges more slowly than some other aquifers.